Chvad SB of Things Outside the Skin & Controlled Bleeding comes to Silber for an ambient drone lament on love & loss. Every once in a while you find yourself holding an album that’s there to stay. “Crickets were the compass” is such album, and I think the reason I like it so much is the fact that besides the great music, The album art is not a conventional cover art that you can find on Drone albums, and the track titles are sparking up the imagination with intense stories. What stories? Well, through drones and loops that can easily cause anxiety on one hand, and remarkable delight on the other, “Crickets were the Compass” is a world of warm points of dense energy, spread across the barren, gloomy aftermath of society. The title track, for instance, is a beautiful drown inside a low and slow growl, while hovering above like distant fire flies are tiny electronic ghosts that are echoing together in harmony. “It haunts Her” is a heavier wave of oscillation with a touching guitar that saying words of comfort over a hostile, menacing and fluid drone. Overall, the holy mixture of hope and loss is clearly evident through this album. Chvad SB, being active for over twenty years, has a very powerful statement of presence. Look for this album, all ye drone lovers! US based artist CHVAD SB is a composer and musician based out of Brooklyn who have been active since the early 1990’s in various bands and projects. He started releasing material under his artist moniker in 2012, his first purebred solo production an original motion picture score for the movie “Gut”. “Crickets Were the Compass” is the second album issued under the Chvad SB name, and was released through US label Silber Records in 2014. As with many artists releasing their material through Silber Records, Chvad SB is one of those artists that explore music that resides safely in a relatively small niche placed well outside the overflooded mainstream music segment. In this case ambient is a key word, alongside drones. When that has been said, the musical expression explored revolves around moods that are just about as far removed from relaxing as you can get, so those who associate ambient music with moods of relaxation and new age territories might just be a little bit shocked if they decide to take this album on. The compositions are all rather slow moving affairs, often minimalistic in build up and arrangements, and all developments are carefully inserted without any rush whatsoever. These aspects of the material are the ones that merits ambient to be used as a description, as well as the use of frail, subtle effects as counterpoints and contrasts to the dominating sounds in each given creation. The dominant sounds throughout are dark toned drones of various kinds and intensities, from surging electronic sounds to hovering synths and fluctuating noisescapes with more of a machine like quality to them. Fairly often with an additional undercurrent of dark sounds, with everything from a constant hovering synth to what may sound like distant explosions adding an additional depth of darkness to the proceedings. Noise reverbs, delicate light toned electronic sounds, occasional shrill and light toned guitar details and cold, light toned electronic textures of various kinds are then applied in part or in whole. The end result are slow moving constructions with repetitive, hypnotic sounds that maintains attention quite nicely, with subtle shifts, alterations and developments that in addition to the subtle contrasts strengthens the hypnotic qualities of the atmospheres crafted. In terms of mood and atmosphere these are generally dark, bleak and desolate, fairly often with unnerving tendencies. Dystopian soundscapes if you like. If you tend to enjoy dark ambient music of the kind that does explore atmospheres that are desolate and generally void of uplifting tendencies, then this production by Chvad SB is worth an inspection. An affection for drones and noise textures will come in handy, and as many of these creations sports sounds that for me gave associations to science fiction and futuristic landscapes, a certain taste for soundscapes of that nature will probably be an advantage as well. Up to this point in time Chvad SB is probably best known as a former member of the bands Things Outside The Skin, Tongue Muzzle, The Qualia, and Controlled Bleeding (he also runs the record label Facility). Crickets Were The Compass is the third album released under his own name. Chvad has had ties to the Silber label as far back as the early 1990s but this is the first time the two have officially begun working together. Co-released by both labels, Crickets is a wonderfully inventive collection of experimental compositions that comes across sounding like abstract mood pieces. These tracks are peculiar and mostly brooding in nature...utilizing sounds from a variety of sources including synthesizers, found objects, hand-built instruments, guitars, and voice. This release bodes well for future releases from these two well-known underground labels. The music is strange and unorthodox...and yet still completely effective and listenable. Six perplexing cuts including "It Haunts Her," "People Keep Asking And I Say You're Well," and "Crickets Were The Compass And The World Goes 'Round." Truly creative stuff. Top pick. ~ Edward Trethowan, Chain D.L.K. “It Haunts Her” opens the collection up with great dread. Buzzing continues for the duration of the song as lonely guitar plucks haunt the empty space. Things get considerably more abstract on “A Hair Before Sundown” which plays with the harsh noise accompanied by what sounds akin to a children’s toy. Echoing around the space the toy gives off a sense of playfulness in the harsh foreboding realm. Minimalism defines “The Dust Cloud Permeates” which appears to fall into an expansive droning groove before it completely loses itself. Retro sounds come into play in the anxiety-ridden piece “People Keep Asking And I Say You're Well”. Little pings help give off the sense of something truly unsettling. Noises here tend to be a bit harsher than elsewhere on the album. Towards the end Chvad SB goes towards nicer territory. “There Isn't a Day That Goes By” is a fairly bouncy happy song that feels oddly cheerful. For the finale Chvad SB continues with the lighter touch allowing the digital decay to melt away revealing a keen ear for melody. “Crickets Were The Compass” is a disturbed oftentimes deranged album in the best way possible. I’m constantly moved by the cover for “Crickets Were The Compass”. A cartoon of a dog staring wistfully into the distance, waiting for his master, who’ll probably never come – there is something both touching and depressing in this picture. The background is kept in gray tones presenting an apocalyptic scenery, and this poor little guy in front of everything – for me it definitely makes more of an impression than the Photoshop wastelands adorning so many industrial or dark ambient releases, that are as eye-catching as they are trite. And this ball, which no one will use to play with the dog. Yes, I feel some wetness in my eyes. Chvad SB is an enigmatic figure, even though he’s been musically active for over twenty years. During this time he has worked with such groups as Controlled Bleeding, Things Outside The Skin and Tongue Muzzle among others, and has also dabbled in film music. It’s his very first effort under the Chvad SB banner, made through Silber Media Recordings. “Crickets Were The Compass” is a bit like the cover: it unveils a world shrouded in ashes and radioactive dust. It whistles like the wind in empty rooms, creaks like a rusted swing, hums like a military plane during its last patrol. Sometimes the atmosphere is brighter: one can notice some snatches of memories from the time before. It’s difficult to discuss “Crickets Were The Compass” in the context of a typical dark ambient recording. Chvad SB’s work is definitely more experimental. The artist uses a whole bunch of sounds that have their origin both in instruments purchased in the store, and made by himself in the basement. There are modular synthesizers and processed human voice. No standard-sounding computer or keyboard-generated drones; there’s a feeling of earth-bound naturalness in this music, which should obviously be taken as a compliment. The musician is quite restrained in using his means of expression, never overusing any of them and often deliberately not displaying all the cards. While generally speaking, other post-apocalyptic albums (literally or figuratively, on a global or individual scale, no matter) sparkle with detail, directly communicating the emotions, Chvad SB once again reminds me of the cover. Like a sketch, seemingly devoid of particularities, but if you look closely you can see (and hear) all kinds of nuances that suddenly assume a deep meaning, and their discovery brings the listener a lot of satisfaction. All the time I feel an empathy towards the dog, and this definitely one of the reasons why the album affects the imagination so deeply. Musically it is very suggestive, just like the graphic design. If you are looking for something original and emotionally involving, but not in a trivial and mawkish way, “Crickets Were The Compass” is for you. Some strangely affecting moments on Chvad SB’s Crickets Were The Compass (SILBER RECORDS NO NUMBER). This American experimental droner has been active for over 20 years with his band and solo work. Here he works against the trend towards “lushness” in ambient electronica, and his empty-stage pulsations and eerie bleak tones hint at inner darkness and desolation, like three heavy-hearted bats sighing at twilight. Unsurprising that he gets film score commissions; instant atmosphere is his bag. If Chvad SB doesn’t directly ring a bell; some bands this American artist has been involved in have become quite renowned and established bands. Controlled Bleeding even belongs to the so-called pioneers and references in industrial/experimental music, but Chvad SB got also involved in The Qualia (signed on WTII Records), Tongue Muzzle ao. 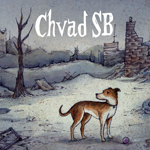 Chvad SB is a solo-project that has released 2 previous albums. The dark-ambient and soundscape influences running through the work are quite noticeable elements, which seem to say something about the sources of inspiration. Chvad SB affirms to be influenced by famous names like Lustmord, Coil, The Residents or yet Controlled Bleeding. I can’t say that one of these bands is coming through on this work, but as I already mentioned, there’s a solid dark-ambient input. We’re moving throughout dark, nihilistic spheres, which in a way are quite symbolic for the desperate and cartoon-like cover featuring a desolate landscape filled with ruins, death trees and a lost dog in the middle of this surreal universe. A dark humming ambiance welcomes the listener to join in for an apocalyptic ride. The tracks remain obscure and accomplished by some spooky effects. A few subtle drones can be heard now and then while other experiments with guitar can be noticed as well. Chvad SB is using a wide arsenal of sounds moving from modular synths to found objects, hand-built instruments, guitar and even the voice. The result is not exactly into ‘classical’ ambient music rather than an abstract approach mixing ambient and experimental music. It might explain the inspiration coming from a band like The Residents although I can’t speak about emulation. “Crickets Were The Compass” sounds original and creative. Noise waves have been mixed with discrete and subtle bleeps while there also is a kind of cinematographic inspiration. That’s not of a coincidence as Chvad SB already worked on multiple soundtracks for films. Conclusion: I like this different dark-ambient approach, which sounds as an interesting alternative to more classical dark-ambient formations. I can only recommend this album for all lovers in the genre. In another remarkable coincidence regarding the luck of the draw for our CD reviews (live events seldom work out that way except hearing three performances of Beethoven’s Overture to Lenora No.3 in Ottawa within the span of a few days in the ‘70s), how curious indeed to find a pair of albums written in homage to special beings. Perhaps there is no better way to honour a loved one than to create music that will outlive us and be immediately accessible to all those who choose to hear. Having become familiar with composer/performer Chvad’s talents thanks to the filmmaking skills of Elias, it only seemed natural to sample this 55-minute work and learn more. Unlike Daniel Detrick, whose post-composition, 10-line poem tellingly served as the “names” for each movement, Chvad’s poetry informs the titles for each of the six sections (the complete text becomes the production’s entire program note). “It Haunts Her” immediately sets the tone for the electronic, digital soundscape that lies ahead with its throbbing, pulsating power, angry pedal and a few bits of childlike “ding, dong” that describe many facets of the dearly departed’s personality and—ironically—shared comfort in silence. “A Hair Before Sundown” is immediately awash in cascading waves of distortion anchored by a low, tolling beat. A few sweeping whooshes are drily contrasted with chips of woodblock, then a metallic tune also finds its inner child if not its flaxen hair. This day closes with a touch of monotony. A welcome breath of consonance ushers in “The Dust Cloud Permeates” before yielding to electronic granules served upon an austere aural canvas. On several occasions a high-pitched guitar pics its way into prominence, briefly rekindling the “ding dong” motif, becoming more agitated before slipping back to rhythmic—relatively—insignificance. Everything gradually calms down, as if running out of gas, more fuelled by octaves than octane. “People Keep Asking and I Say You’re Well” speaks chirpy volumes (heralding the finale, to come) as various motors roar to race-like life—the same old question, hardly a picture of health, is given a relentless, if melodic, answer until a glimpse of “The Last Post”—above a slow motion chorus—foreshadows anew as everything comes to quiet rest. Here the incessant ostinato and equally unrelenting bass produce a hypnotic effect as “There Isn’t a Day That Goes By” unfolds. Two contrasting voices appear at different times, sprinkled in with some bits of “finger snaps” and ripping paper (or might that be a new leaf turned?). The result is absolutely, abstractly fascinating. After so many forms and styles, :”Crickets Were the Compass and the World Goes ‘Round” feeds largely on a 6-repeated-note sequence that rises higher and higher—at times with crushed grace notes furthering the insect imagery—above the Gryllidae chattering classes. Given that natural cacophony, who would know where to turn when—at this thoughtful time for reflection—everything leads down the same path of heartfelt remembrance and loss? As mesmerizing as the music can frequently be, a cinematic treatment might stretch its current “legs” further still. Chvad SB, in his latest, Crickets were the Compass, follows Brain Eno's On Land dicta far more cogently than most, then gets spacefaced and even Can-rocks a bit. The Dust Cloud Permeates is a prime example of this, dark and subtle, moving in layers, cross-stitching modalities. Anyone with half a wit knows Satie's 'furniture music' (properly 'musique d'ameublement' or 'furnishing music') was never meant to be a chair or armoire but instead a tableau, a still life, a miniature. In fact, the widely touted gnossienes and gymnopedies were not among what others have attributed to his furniture musics. Erik himself named only five pieces thusly, not one of them a gnossienne or gymnopedie…though I doubt he'd much quibble with what's been claimed regardless, his Rosicrucianism a bit too zen to be that crass. Satie's interest was that "furnishing music completes one's property". Indeed, and Chvad SB's work becomes an extension of that, telescoping perception beyond the living room through the woods, over the lake, into the skies, and then beyond. In fact, I find these pieces to be a perfect cross between Eno and PBK (Philip B. Klingler), as the former was for quite some time fascinated by milieu qua milieu while the latter was a micro-surgeon delving into the componentry of ambientalism, tearing it down for its molecular and atomic secrets. Crickets is not music for gamboling or even a quiet chamber saturnalia but instead interactive meditation, in the 70s known as 'tripping out'. Each piece (ignore the titles, they mean nothing) is an exercise in cerebellular architecting; that is: building structures within the brain itself. There isn't a Day That Goes By even incorporates a staple of musique d'ameublement: the sort of repetitive minimalism seeing beatification in Phillip Glass' oeuvre. Chvad SB's is not music to listen to but rather to exist within, all the more so if you're under the influence of an intoxicant of some sort, whether alcoholic, herbal, or hallucinogenic, anything causing the human monkey mind to cease its inner prattle and just be. Lacking that, you won't quite get all that's here, though you might still capture significant portions. Silber Records puts out a lot of cool experimental, electronic, and ambient works, but this is one of the best they've so far procured. Listen to it if you're not quite sane yet serious about music. Allow yourself plenty of time before hitting play as Chvad SB delivers his extended pieces which can run to the best part of a quarter of an hour. The grumbling and groaning crackles commingle to form rumblings of malevolence which dissipate through the brain in ever flowing threads of sound. Electronically generated sounds combine with hand-made instruments, guitars and occasional vocal to paint aural abstract imagery of loss. Whilst stretching the electronics, the music doesn’t sit uncomfortably with the listener who is drawn into the eerie noises that simultaneously have a calming and restive resonance. The creations are not impenetrable as Chvad SB develops the themes of the tracks in exquisite loops, which despite their duration are stripped of the extraneous giving the resulting out-put an earthy realism. Having been around for a few years now Chvad SB has been able to refine his craft and the latest release, the seven track enigmatically titled, Crickets Were The Compass is a fine exposition of his work. I recommend finding some time to explore the themes and virtual organic synthetics of a talented sound designer. Though complicated in name, Chvad SB’s Crickets Were the Compass is even moreso in delivery, which is why it’s a long term reward (as is learning the name). Crickets Were the Compass is both the darkest metal and drone, and though it doesn’t rely too heavily on either, the elements are still present enough to label it both so fans of the genres are keen to find it. Both are haunting enough in title to project one’s own experiences but “The Dust Cloud Permeates” is a particular, airy piece that mimics specs floating in a beam of sunlight only to be broken by shade. “People Keep Asking” is heart-wrenching as the aggressive static of doubt battles with sharp tinges of hope. It’s a lonely world out there. Having Chvad SB providing a soundtrack makes it a little less so. Chvad SB has been active in music since 1991, running Facility Records (with whom this is a split release) and playing in a number of bands such as Things Outside the Skin, Tongue Muzzle, The Qualia, and most recently joining pioneering experimental band Controlled Bleeding. This CD features thought provoking artwork by Richard Sala, of a post-apocalyptic scene populated only by a dog, whose expression looks forlorn yet hopeful. A faint glimmer of hope, a glimmer of life within a deathly landscape; a juxtaposition of bleakness and optimism that is mirrored in the music itself. Dissonant, abstract rumbles and drones and harsh mechanical and computerised sounds creating an unsettled mood are punctuated by moments of beauty, courtesy of the melodic passages played on synth, xylophone and guitar. There Isn't A Day That Goes By does away with the harshness altogether; it's a soothing ambient piece with heartbeat-like pulsing rhythms, relaxing atmospheric synth sounds and a hypnotically repetitive melody. Despite the 'difficult' nature of the music, this is actually an engaging album that demands the listener's attention. It’s an infrequent occurrence when we stray from cinema in our reviews but every once and a while we do -and there’s a method to our madness. Chvad SB is the musician behind the score for Gut [review here], his LP Crickets Were The Compass has just been released and is available through Silber Records. The opening track, It Haunts Here, builds like the recollection of an air-raid siren in a dream. It draws the listener in to an uncertain frame of mind that’s incredibly rich. From there A Hair Before Sundown takes a jagged edged turn that invites an emotional response that tugs at the listener and drags them between invasion and illusion, fantasy and frenzy as Chvad builds the atmosphere that the entire aesthetic of the LP is built upon. The Dust Permeates is very much the tour de force of Crickets Were The Compass. At 14 minutes in length it demonstrates the artistic leanings of its creator and the same sort of creative ingenuity that Radiohead’s Kid A showcased when it was first released. People Keep Asking And I Say […] may sound as though it’s influenced by Bob Dylan (if you judge books by covers and songs by titles) but in the hands of Chvad SB it has the trickling relief of consciousness as it emerges from the dark, almost Weimarian landscape of dream...nay, nightmare. Crickets Were The Compass is a provocative, challenging, cinematic LP. It creates a strong, darkly dystopic narrative that is as heavenly as it is haunting. A powerful offering from a hugely talented artist. Chvad SB is a Brooklyn based noise/ambient artist that has been chugging along for a few years now. This set of songs might be his most cohesive to date, with some of the oddest and most terrifying sounds you may here this side of the haunted house. No, this is not music that is intended to revolt, but the haunting atmospheres sustained for extended periods of time will surely cause some discomfort in many listeners. Not me however, as I am a serial killer always looking for a new soundtrack to haunt my prey to. This is not "easy" music, but it is worth your time. At the start of last year I reviewed a grim indie film called Gut which was about a man and his friend who discover a real life snuff film and become hypnotised by it. The best thing about the film was the soundtrack that conjured up a real sense of unease. The artist responsible for that soundtrack Chvad SB has released a new album that came out on May 13th via Silber Records. I am never comfortable doing reviews of music, I just do not feel I have a true grip on music, for me visual media is something that I am confident of reviewing well. Still here I am, I can only try my best and practise makes perfect as they say. Crickets Were the Compass features six tracks of droning terror and unease. Now this is not the music you would play to woo a loved one, nor one you would stick on to listen to after a hard days work. I personally listened to it as I searched for jobs on the Internet, making brief notes about each track as I went. In his own words the album is a testament to loss, a story of coming to terms with fond memories and letting them go. While this is purely a instrumental album each song has its own beautiful little poem in the CD case that certainly backs this idea up as they read like someone who has lost the light in their life. The CD case features artwork from Richard Sala of a sad looking dog in an apocalyptic landscape. Opening track "It Haunts Her" gets things off to an unsettling start, this is the sort of music I imagine would be playing over crackly speakers as you sweat it out in a third world interrogation room, or maybe be on in the background as you awake one evening to find yourself caked in blood and a dead body in the bathtub. For the rest I came up with key images that the sounds evoked from me. Second track "A Hair Before Sundown" brought to mind a nuclear wasteland. Next was "The Dust Cloud Permeates" which is what I would have on my iPod if I was lost in a maze of back alleyways in a bad neighbourhood in the dead of night. Now the fourth track "People Keep Asking And I Say You're Well" would be the background accompaniment to hallucinating a loved one is unable to stop puking up blood but doesn't seem to realise this. The penultimate track "There Isn't A Day That Goes By" made me think of a strange, hostile alien landscape while the final track "Crickets Were The Compass And The World Goes 'Round" evoked severe depression; long days stuck in bed with not the energy to get up or look after yourself. They were just what entered my brain pan as I searched for jobs (boy do I currently dislike my current day one) though obviously not the intention of the artist. I really don't know what the ideal place to listen to this album would be, maybe while lying in bed working through problems, or maybe whilst writing blog posts on a worldwide famous horror blog. Each track is full of droning horror and doom, each unsettling, menacing, yet at times just full of sadness and regret. For the first time in the history of the Horror Movie Diary, I got the chance to review some music! NY-based artist Chvad SB got in contact with me because I praised the music he composed for Elias' awesome indie shocker "Gut" (see here! ), and thought I might be interested in his latest album. Did I like it? Well, I did, though it's something completely different and has nothing to do with the "Gut" score. "Crickets Were The Compass" is an unbelievably bizarre piece of art, consisting of six abstract instrumentals, somewhere between Sunn O))), Isis, (maybe) Ulver and other drone / doom / post-rock / post-metal stuff. It's not an easy record and the majority of music-lovers out there probably won't like it. There's nothing catchy or earworm-like on this album. It's all grotesque and eerie, quite dark, slightly dissonant, pretty unsettling and in some kinda way completely fucked up. Imagine Scott Walker sitting in an abandoned building somewhere in a littered desert, going completely insane while trying to compose a new soundtrack for "Eraserhead" or "Begotten". That's how it sounds, that's how it feels to me. "The Dust Cloud..." is too long and a bit too tedious, but the other tracks are all very fine, especially the magnificently atmospheric title track and the mesmerising "There Isn't A Day..." that somehow manages to cast a powerful spell over me. If you're a patient listener, and if you're into one of the above-mentioned sub-genres, you really need to check out "Crickets Were The Compass", a fascinating album that grows and grows and grows. Those of you who read my Gut movie review, might remember me saying the music had a sort of a eerie electronic vibe, affordable but haunting. Well good news, Chvad SB (the artist from the Gut soundtrack) has released an album titled "Crickets Were The Compass". While only having 6 songs it clocks in at a whopping 47 minutes of music thats a whole lotta bang for you buck. The music is best described as more of electronic eerie drone music. The sort that you have to listen to with your eyes closed and your mind free to think a story with the music. I feel its excellent stuff for any indie movie maker to use. It's not a release I would recommend playing at a party or just in the car, it's stuff you need to be in the mood for. And that might be the album biggest fault, it IS long and frankly hard to sit through in one sitting. I had to take a break in between listening because I was loosing focus of the music. The artwork is done by Richard Sala, its well done. It really captures the feel of desolation, loneliness and sense of having lost something. It fits the moody music well. Since its purely instrumental their is no need for lyrics so I can see why they didn't include a booklet in the release but still It would be great to have even some more artwork and maybe some fotos in a separate booklet next time. Concluding, what we have here is scary, eerie and a good soundtrack to slowly getting insane. No rating this time because its truly something you like or not. Give it a try. A new name for me, this Chvad SB (and how to pronounce that? That's why our podcast doesn't have spoken intros to each track. I don't want to run the risk of being laughed at an 'entirely' wrong pronunciation). This Chvad SB has been a member of such as Things Outside The Skin, The Qualia and recently Controlled Bleeding. In 2010 he founded his own band Tongue Muzzle. I received three of his most recent releases. Following a quick scan of all three I started with the solo CD, which I guess is indeed all solo. There is no specification towards which instruments were used, but my best guess would be electronics, synthesizers, guitars and maybe some other stuff, such as voice, but then heavily processed. Silber tells us that some of this stuff was improvised and some were composed over a number of years. I couldn't tell which apart, and I am not sure if that is a good or a bad thing. A piece like 'The Dust Cloud Permeates', the longest on the disc, seemed improvised and didn't do much for me. It seemed to revole around a few sounds, loosely played on the guitar, some drone in the background, but not very well defined. I must say that the more electronic pieces were, the more I seemed to like them. When a guitar comes in it seems to bring down the music a bit, and if it was (all) electronic it seemed to be more together and quite powerful. I was reminded in the use of these synthesizers in a dark, atmospheric tone of some of the work of Controlled Bleeding, such as 'The Poisoner'. Those pieces I liked best and luckily they were a majority around here. Maybe mastering the whole thing would have been an idea? Maybe I am wrong? Het hoesje van dit album toont een tekening van een troosteloos landschap met kapotte huizen, dode bomen en een hoop afval en op de voorgrond een eenzaam en wat triest kijkende hondje. Het heeft iets lieflijk en onheilspellend tegelijk. De muziek klinkt vooral onheilspellend en desolaat en even post-apocalyptisch als het landschap op de hoes. De minimaal repetitieve drone ambient kabbelt langzaam voorbij in zes composities in lengte variërend van 4,5 tot 14 minuten. Chvad SB maakt al muziek sinds 1991 met projecten als Things Outside The Skin, Tongue Muzzle, The Qualia en – last but not least – als medelid van Controlled Bleeding. Invloeden haalt hij naar eigen zeggen onder meer bij Lustmord, Coil, Swans, Jean-Michel Jarre en The Residents. Bij het beluisteren van het album “Crickets Were The Compass” – zijn derde album onder de eigen naam voor zover we kunnen nagaan - komen naar mijn bescheiden mening de invloeden van Lustmord het meest tot uiting. Chvad SB maakt voor zijn soundscapes gebruik van modulaire synthesizers, gevonden voorwerpen, zelf gemaakte instrumenten, gitaar en stem, zo leert ons zijn facebook pagina. Dit album is echter 100% instrumentaal. Het zijn de iets kortere tracks die mij het meest aanspreken. Het dreigende “A Hair Before Sundown” bijvoorbeeld of de spookachtige, desolate monotonie van openingstrack “It Haunts Her” dat zijn titel meer dan waar maakt of het wat meer industrial getinte “There Isn’t A Day That Goes By”. Het album sluit af met het 12 minuten durende titelnummer, waarin inderdaad langdurig een krekelachtig geluid zit. “Crickets Were The Compass” (6 tracks, 54 minuten speelduur) is een sfeervol, post-apocalyptisch dark ambient plaatje voor de liefhebber. Chvad SB maakt al dik twintig jaar muziek/geluid voor films. Niet dat het op een soundtrack terechtkomt, daarvoor is het meestal te abstract, te ongemakkelijk, te discordant & discomforting zoals velen het noemen. Deze keer is er alsnog een pak geluid geregistreerd en als Crickets Were the Compass op de markt gebracht. De veelheid aan emoties is er, maar het leeuwendeel van het spectrum bestaat uit eerder negatieve klanken en composities. De creaties zijn afkomstig van "modular" synthesizers, gevonden objecten, zelfgemaakte instrumenten, gitaren en stembanden, wat dikwijls leidt tot onidentificeerbare passages waar je best niet al te veel bij stilstaat. De drones zijn voor mij de belangrijkste factor op dit album, samen met de industriële/ritmische noise en de kleinkunst-instrumenten. Het doet me denken aan een plattelandsdorp dat last krijgt van nucleaire straling. Bevalt dat idee je, trek dan dit schoentje aan. das cover scheint einen auf den irrweg schicken zu wollen; das gegenteil ist der fall: comic-stil (und dann auch noch mit einem hund als charakter), das hat schnell etwas niedliches. bis nicht nur der „gesichtsausdruck" des hundes ins auge fällt, sondern eben auch der zustand der umgebung. post-apokalypse irgendwie. wenn dann noch zu lesen ist, chvad sb wollte mit „crickets were the compass" eine art „nachlassdokument von verlust" erstellen, dann kann das von visueller seite schon mal als erfolgreich bescheinigt werden. Juni erscheint das in einem jahrelangen Vorlauf entstandene Album „Crickets Were The Compass“ (Silber/Facility Records) des in Brooklyn beheimateten (Film-) Musikers und Klangforschers Chvad SB. In entbeinter Schwermut schwelgend und sich beiläufiger Simplifizierung souverän entziehend, liegt ein beeindruckendes Werk vor, das zwischen Dark Ambient und Old-School Industrial oszillierend eine Überfülle an Ideen dem Wettlauf gegen die (Lauf-) Zeit aussetzt. Verhaltenes Grauen, gediegene Ohnmacht und das große Warum im Modus des Verlustes. Dieser Kompass weist vom diffusen Diesseits hinaus ins Unbenennbare. Schon seit 1991 reüssiert Chvad SB in Industrial/Ambient-Kreisen mit verstörenden Soundscapes und extrem angelegten Soundtracks zu entsprechend extremen Independent-Filmen („Gut“). Wie es in der Szene zum guten Ton gehört, nahm Chvad SB über die Jahre hinweg variable Identitäten und Kooperationen an (Tongue Muzzle, The Qualia bis hin zu den Industrial-Dub- Pionieren um Paul Lemos, Controlled Bleeding). Bei „Crickets Were The Compass“ gehen Mensch und Werk jedoch eine vernehmlich enge Symbiose, eine Identität ein. Sehr intim, sehr persönlich und absolut frei in der Wahl der Mittel, gelingt Chvad SB ein Seelenbild, das betroffen macht und permanent beunruhigt, denn: Es könnte jeden treffen. Das Verfahren, rein improvisierte Passagen mit in jahrelanger Akribie entstandenen und vorab konservierten Elementen zu amalgamieren, zahlt in die auffällige Direktheit ein, mit der das Album seine Wirkung entfaltet. Kaum neigt der Hörer zu der Ansicht, es mit recht simpel erzeugten Soundscapes zu schaffen zu haben, regt sich schon wieder der gegenläufige Verdacht, dass es sich um ein hochgradig artifizielles und überaus komplex arrangiertes Sammelsurium aus Klang gewordener Entfremdung handelt. Chvad SB spricht das Gefühl sowohl über den Intellekt als auch über die physische Erfahrung an. Wenn auf die Magengrube abzielende Passagen in minimal gehaltene Momente der Innenschau münden, zeichnet sich eine Ahnung von unmittelbarem Verständnis ab: „Barely audible through the dusty road / floating in the beams of light, particles drift“, beschreibt es Chvad SB selbst, im Zusammenhang mit den Track „The Dust Cloud Permeates“. Es geht ihm ganz offensichtlich nicht um die Erzeugung von maximalen Affekten durch die Verwendung allzu berechenbarer Mittel. Die sich daraus ergebene Tendenz zur Reduktion und Konzentration verbietet auch nur den zartesten Anflug von Beliebigkeit. Kein „Hören mit Schmerzen“, vielmehr ein Erleben sorgsam verhaltenen Grauens unter klar akzentuierten Voraussetzungen und Vorzeichen, die gemeinhin allzu gerne verdrängt werden. Verlust und Resignation als Chance. Sehr zu empfehlen. Lustiger Ambient-Stoff von einem Könner. Zumeist hört man hier in erster Linie mit Geräuschen aufgefüllte Stille, die aber zugleich bedrohlich wie atmosphärisch wirkt. Dafür fällt aber einem auch jedes Element auf. Nett! Wenn zum Beispiel aus dem Nichts langatmig ein schwirrendes Geräusch erhebt, dass irgendwann in ein fast-Drone mündet, ist man schlussendlich begeistert, sobald die Idee einer Xylophon-Melodie durchbricht. Bei welcher „Musik“ hat man das sonst schon? Auf dem Höhepunkt wird das sogar durch angedeutete Streicher und ein paar Töne der E-Gitarre ergänzt. Die grosse Kunst von dem erfahrenen Soundcollagen-Schmied aus Brooklyn ist aber auch mit minimalen Mitteln maximale Bedrohlichkeit und eine angenehm düstere Stimmung zu erschaffen. Man muss von der schlichten Genialität bei der Erreichung dieses Ziels den Hut ziehen. Wer sich auf diese Platte einlässt, findet viele kleine Lieblingsecken in dieser nur vordergründig unstrukturierten Geschichte, die uns wohlige Schauer über den Rücken jagt. Ganz so einfach ist das aber auch nicht. Dass Musik eine Kunstform ist, steht außer Frage – und wie bei jeder Form von Kunst ist eine allgemeingültige Definition nahezu unmöglich. So lässt sich der sarkastische Satz „Ist das Kunst oder kann das weg“ auch auf so manche CD anwenden – denn was in den Augen (respektive Ohren) des einen Ausdruck höchster Kreativität darstellt, lässt den anderen oft ratlos zurück. CHVAD SB ist eines der Projekte, die den Hörer diesbezüglich auf eine harte Probe stellen: Denn wo manche im Werk des Musikers aus Brooklyn eine kunstvoll arrangierete Mischung aus Drone und eperimentellen Ambient zu hören vermögen, klingt das mit einem niedlichen Hündchen illustrierte Werk „Crickets Were The Compass“ für andere wohl nach nicht mehr als einer Dreiviertelstunde belangloser Geräuschkulisse. Verständnis lässt sich für beide Seiten aufbringen: Bei dem Sound (jedoch nicht unbedingt der Wohnsituation in einem Mietshaus) angemessener Lautstärke und restlos abgedunkelten Fenstern kann man „Crickets Were The Compass“ durchaus soetwas wie Atmosphäre abgewinnen. Lässt man sich jedoch nicht vollends auf das Werk ein, geht CHVAD SB nicht nur zum einen Ohr hinein und zum anderen hinaus, sondern lässt dazwischen ein großes Fragezeichen aufsteigen: Kratzende, schwirrende und zerrende Sounds wabern durch den Raum, während sich als psychedelische Elemente nur einzelne Töne klar als solche zu erkennen geben. So etwas Dynamik oder Dramatik sucht man hier jedoch vergeblich: Der Spannungsbogen des Albums trägt den Namen „Römerstraße“, führt allerdings nicht nach Rom, sondern einfach irgendwo ins Blaue hinein. Man kann „Crickets Were The Compass“ meditativ nennen, aber über Walgesänge wird ähnliches behauptet und dennoch kommt man eher selten auf die Idee, sich mal wieder die „Best Of Buckelwal“ einzulegen. Sollte man aber doch mal wieder in eine solche Situation kommen, in der das angemessen wäre, und peinlich berührt feststellen, dass man sämtliche Alben mit Walgesängen im Freundeskreis verliehen hat, tut es zur Not wohl auch „Crickets Were The Compass“. Danke dafür, CHVAD SB. Početak karijere ovog bruklinškog muzičara seže u 1991. godinu, a prema pres materijalima bio je osnivač experimentalnih i industrial bendova kao što su THINGS OUTSIDE THE SKIN (Facility Records) and Tongue Muzzle (Facility Records) i član bendova Controlled Bleeding i The Qualia (WTII Records). Također, osnivač je i Facility Recordsa. Kad nije sudjelovao u gomili bendova i projekata, radio je i muziku za filmove. Ovih šest pjesama koje su se "ugurale" u 54 minute materijala, prvo su njegovo izdanje za Silber Records. Osim samog sebe na albumu nije želio nikog drugog, pa je tako sve instrumente (sintovi, gitare, "ručno izrađeni instrumenti") sam snimio, producirao i naravno, napisao. Pres materijal kaže, također, da je ovo "testament of loss", a tako se i čini nakon ovlaš pogledanih naslova pjesama (It Haunts Her, People Keep Asking and I Say You're Well, There Isn't a Day that Goes By), a bome i nakon preslušanog albuma. No, preslušati album nije lako. Nema tu baš puno melodija. Nema ni pjevanja. Većinom su to zujanja različitih instrumenata, a dogodi se i po par minuta tišine, koliko god ja pojačavao glasnoću zvuka. No, unatoč gubitku, Chvad SB očito nije neki agresivac, jer većina pjesama je mirnijeg tonaliteta. Iako ja nisam toliko dubokoumno raspoložen da bi do kraja mogao shvatiti "što je pjesnik htio reći", "Crickets were the Compass" sigurno je jedan od ultimativnih drone albuma ove godine, ako ne i šire. Am 30. Juni erscheint das in einem jahrelangen Vorlauf entstandene Album „Crickets Were The Compass“ (Silber/Facility Records) des in Brooklyn beheimateten (Film-) Musikers und Klangforschers Chvad SB. In entbeinter Schwermut schwelgend und sich beiläufiger Simplifizierung souverän entziehend, liegt ein beeindruckendes Werk vor, das zwischen Dark Ambient und Old-School Industrial oszillierend eine Überfülle an Ideen dem Wettlauf gegen die (Lauf-) Zeit aussetzt. Verhaltenes Grauen, gediegene Ohnmacht und das große Warum im Modus des Verlustes. Dieser Kompass weist vom diffusen Diesseits hinaus ins Unbenennbare. Vent’anni di esperienza pagano, eccome, vi basti sentire come riescono a elevare il nuovo lavoro di Chvad SB, pseudonimo dietro cui si nasconde un artista americano (il nome non l’ho trovato), fondatore della Facility Records e fautore di diversi collaborazioni con nomi tipo Things Outside the Skin e Controlled Bleeding. In questo nuovo lavoro, Chvad esplora il dolore della perdita e la successiva redenzione, esemplificata da pezzi inquieti come People Keep Asking and I Say You’re Well, lunga esplorazione ambient composta di sintetizzatori, oggetti ritrovati, strumenti musicali realizzati a casa e chitarre. Se è facile evocare entità come Coil o Roll the Dice ascoltando There Isn’t A Day That Goes By, è però vero che il lavoro di Chvad riesce a emozionare fin troppo facilmente con una quieta ripetizione melodica di semplici sequenze. La lunga title track in chiusura, invece, romba inquieta in sottofondo senza mai uscire allo scoperto, preferendo dipingere un orizzonte infinito di grigiore da cui, in qualche modo, risorgerà la speranza di andare avanti e superare i propri traumi. Der sich Chvad SB nennende Musiker stammt aus Brooklyn, NY., USA und hat seit 1994 eine umfangreiche Diskographie angesammelt. Darunter sind mehrere im Alleingang aufgenommene Soundtracks sowie Aufnahmen mit experimentellen Projekten, wie z.B. Thing Outside the Skin und Tongue Muzzle. Auf “Crickets were the Compass” widmet sich Chvad SB avantgardistisch angehauchter Musik, die man wohl als Dark Ambient bezeichnen kann. Die Instrumentals des 2014 aktuellen Albums verarbeiten angeblich die Gefühle des Verlustes und des Verlorenseins sowie andere vergleichbare Erscheinungen. Zu jedem Titel hat der Künstler noch einen kurzen Kommentar verfasst, der die Gedanken hinter der jeweiligen Komposition, oder Improvisation zusammenfassen soll. Die zusätzliche Anmerkung zu „People asking and I say you’re well“ lautet z. B.: „They ask how you’ve been, I say you‘re well, I wish I knew that were true“. In Verbindung mit dem rührend-apokalyptischen Artwork (das einen einsamen Hund in einer zerstörten Stadt zeigt) und der durchaus eindringlich schwermütigen Musik liegt einem sicher kein Gesamtkunstwerk vor, der zur Entspannung einladen würde. Gut so: die Musik darf auch als Herausforderung aufgefasst werden. Um seine zum Klang gewordene Herausforderung umzusetzen verwendet Chvad SB vor allem Gitarren, Synthesizer, Gegenstände des täglichen Bedarfs und selbstgebastelte Klangerzeuger. Die eher minimalistisch angelegte, öfters mit einem Industrial-Touch versehene Musik variiert zwischen monoton-verstörend, resigniert-melancholisch und unterschwellig aggressiv. Musikalische Gefälligkeiten sind ebenso wenig zu erwarten, wie Songstrukturen mit Gesang. In „A Hair before Sundown“ treffen beispielsweise knurrende Synthesizer auf perkussive Strukturen, die von Xylophon zu stammen scheinen. „The Dust Cloud Permeates“ klingt wie eine finstere Ambient-Collage aus verzerrten Feedbacks, repetitiven Gitarrentönen und surrenden Synthies. Der erste noisige Teil von „People Keep Asking…“ wird bei manchem konservativem Hörer die Frage nach den Grenzen zwischen Musik und bloßem Geräusch aufkommen lassen. Aber die Geduld wird belohnt: nach dem noisigen Auftakt beginnen sich langsam melodische Ambient-Strukturen herauszuschälen. Die schleifenartigen Soundscapes von „There isn’t a day…“ könnten den Fripp-Sympathisanten in uns ansprechen, falls vorhanden. Teile von „Crickets were the compass…“ ähneln den frühen Krautrock-Industrial-Elektronik-Experimenten in der Art von Kluster. “Crickets were the Compass” kann als post-apokalyptische Soundtrack-Vorlage verwendet werden, z.B. um sich zu vergegenwärtigen, wie gut es uns zurzeit noch geht.